Rajiv Singh has made key contributions in several areas of materials science and engineering related to innovative processing materials. He created the world’s largest synthetic monolithic diamond using an enhanced chemical vapor deposition technique. This diamond weighs more than 1,600 carats and is approximately 11 inches in diameter. 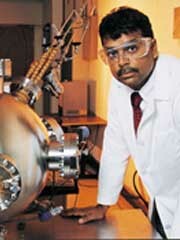 He is one of the original developers of the pulsed laser deposition technique, which has become the most popular method to fabricate oxide thin films. Other recent accomplishments include development of ultraviolet assisted deposition methods for high dielectric constant films, which are expected to replace silicon dioxide in semiconductor devices. Singh also has written a comprehensive laser solid interaction program called SLIM (Simulation of Laser Interactions with Materials) which is used by researchers worldwide to simulate thermal effects during pulsed laser processing. Other areas of interest for Singh include nanostructured materials and chemical mechanical polishing (CMP). CMP is one of the fastest-growing technologies in the semiconductor manufacturing industry. This technology is being used to fabricate computer chips with copper wiring so they can compute faster than their predecessors. Recently, Singh earned the university a patent on a method to control the distribution of medications for such ailments as asthma and diabetes that are transported via the pulmonary system. This technique, which has immense potential, has been licensed to a private company for development. Other applications of this particle coating method lie in phosphors for flat-panel displays and high-speed ceramic cutting tools. Singh has edited six books, published more than 235 technical papers, and given more than 100 invited talks in the area of innovative processing of materials. He has also organized nearly 20 international symposiums and has been awarded more than 10 United States patents. He is a recipient of several awards, including the Presidential Young Investigator Award from the National Science Foundation and the Robert Lansing Hardy Gold Medal from the Metallurgical Society for his outstanding contributions in materials science and engineering.